Quantum cascade laser technology is a relatively recent development (late ‘90s). With no predecessor technology to go on, Theta Engineering pioneered the design for a QCL laser system for a very demanding application: in-situ real-time analysis of combustion gases. This amounted to hanging what was essentially a laboratory instrument on the side of an industrial smokestack! The system had to endure New Brunswick winters and Central Texas thunderstorms while continuing to measure spectroscopic absorption with 1 part-per-million wavelength accuracy. Numerous challenges and unexpected physics were encountered as we pushed the performance of the system to the limits. The QCL Laser system required a "transmitter" for the signals it measured which really is a sophisticated industrial controller. In addition to a built-in user interface for the system, it provides MODBUS over RS485 for remote monitoring and control. This is in addition to 8 channels of 4-20mA analog output and 4 channels of 4-20mA analog input, 2 "digital" outputs (contact closures) and 2 digital inputs (opto-isolators). The controller is architected for high-reliability using separate processors for process-control, user-interface and watchdog duties. 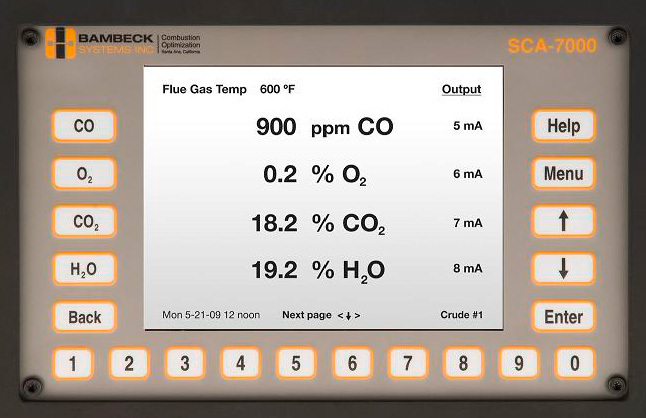 The firmware is uniquely structured to allow configuration via MODBUS register settings for virtually any measurement application: calibration, units, measurement ranges, fault limits and names are all MODBUS-configurable. Today, development is on-going with the 2nd generation of this system. Theta Engineering was instrumental in the new packaging concept and thermal design of the 2nd generation system and continues to improve the manufacturability and operation of the system.